On any given day, you can find stacks of cook books around my house, many of them mine, but also a constant rotation from the library, there are just SO many great new books coming out that speak to me like never before, thanks in large part to the amazing and growing array of healthy food bloggers on the scene. One of the latest I’ve been happily perusing through is Anna Jones – A Modern Way to Eat – lots of yummy looking recipes and I’m working on more than a few, new ideas but plenty you’ve seen before (if you read as many blogs and cookbooks as I do!). 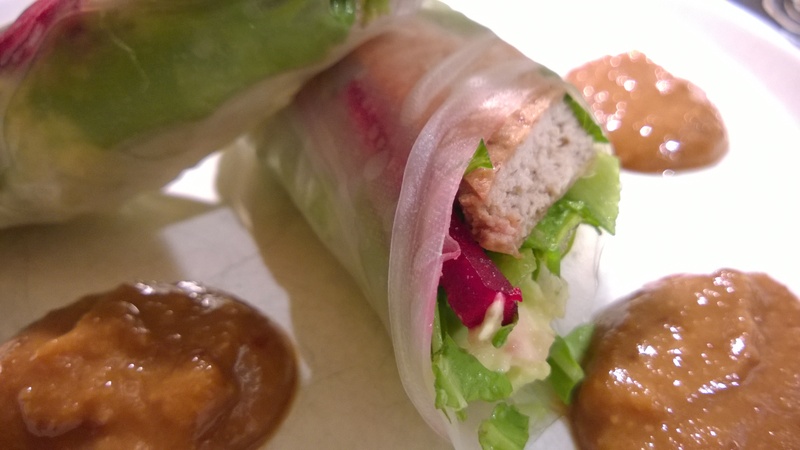 One such recipe, not so different than others I’ve seen and even made, like this, this and that, but it still spoke to me and spurred me to create a new favorite around here, was Anna’s Maple Peanut California Wraps. 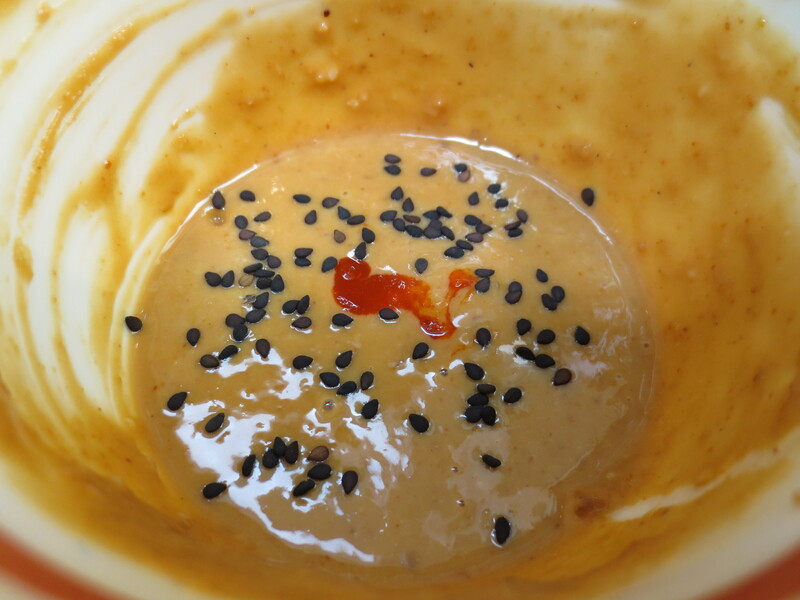 It has so many of the flavors I just love, nutty peanut butter and Tahini, maple syrup, miso, soy and citrus. Of course, I did change up her recipe a bit, varied the measurements of ingredients and most notably swapped out Anna’s lemon for lime and replaced her tempeh for tofu. What I ended up with was a delicious Tahini peanut lime sauce, perfect drizzled over grilled tofu with greens or rice or soba, yum. If you’re not a fan of tofu, although if that’s how you feel I urge you to try this it may change your mind and may even change your life, really, truly. BUT, this sauce would also work perfectly with grilled chicken (think chicken satay) or even shrimp, as a sauce over soba noodles or nutty brown rice, mixed into shredded cabbage for an awesome slaw, this sauce IS that good, now what are you waiting for go try it. Now let’s talk a little bit about lime….Forever a fan of citrus, I just love the scent and taste of all things lemon, lime & orange, but lemon has always been my favorite, I am finding myself now using lime more and more, I think lime may be my new fave, sorry lemon I still love you, but. 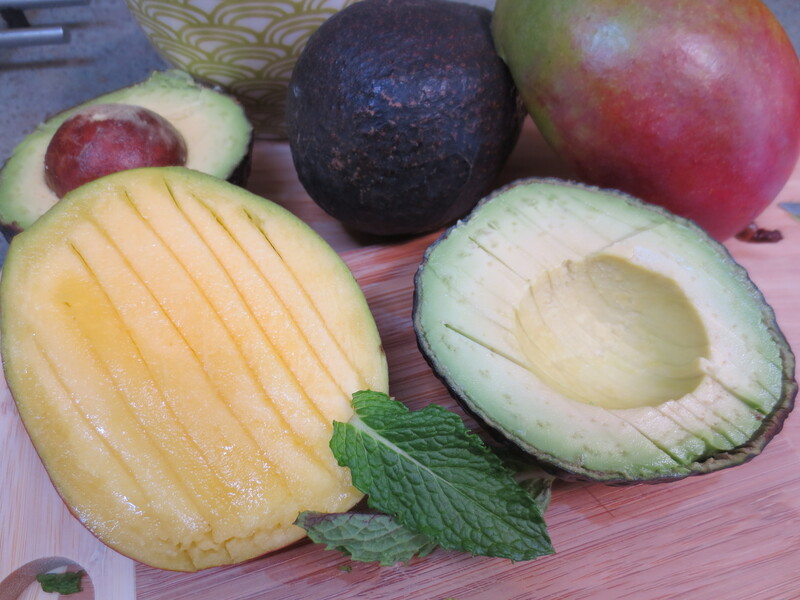 Lime just wakes up the flavor in sauces, dressings and soups without as much of a hit of acid like you get from lemon, it works in sweet and savory and even just a squeeze of lime over some greens works as a nice light salad. You can even mix up lemon, lime and orange to replicate the Japanese yuzu, fresh and clean tasting, you just can’t go wrong with citrus. 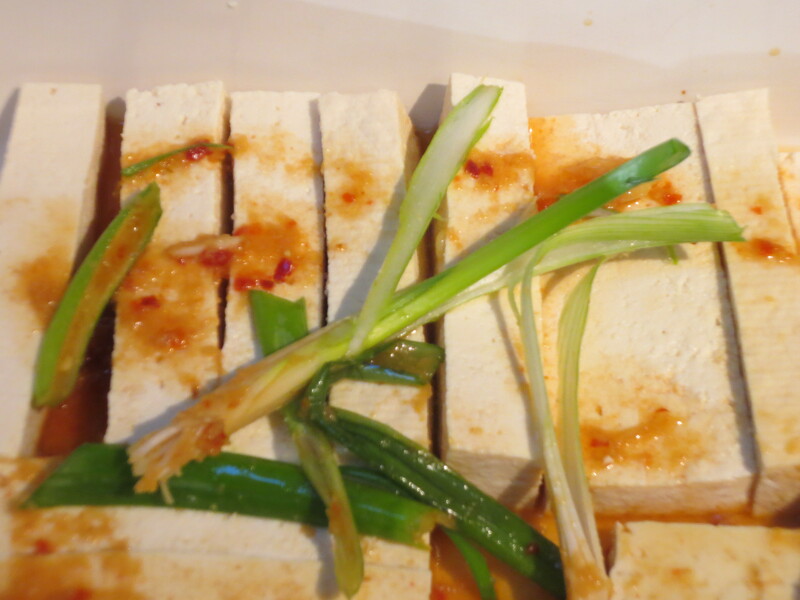 Remove the tofu from the package, drain and carefully press out as much liquid as you can. Heat a large non stick skillet over medium-high flame. Pour in enough coconut oil to cover the pan, sprinkle the pan with salt (flaky sea salt if you have). 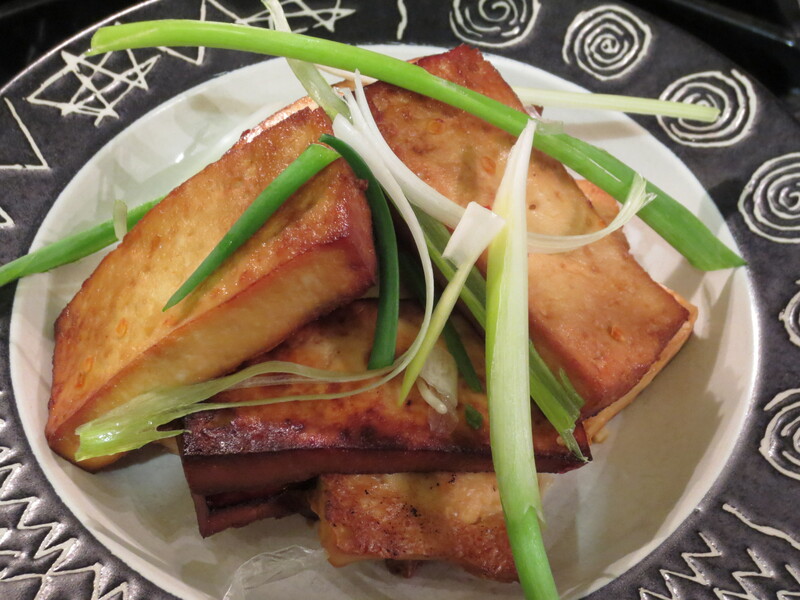 Once the tofu is fully pressed, cut into about 8 slices or 16 triangles if you prefer, add the slices to the hot pan. Don’t stir around, cook until each slice is golden brown, then flip and cook the other side, lowering or raising the temperature as needed or adding additional coconut oil. Once the tofu is cooked on both sides, remove from the pan to a cutting board and allow to cool a bit, then cut each piece either in half or in thirds lengthwise so you have finger sized pieces of tofu or leave as is if you already cut into triangles. While the tofu cooks mix all of the sauce ingredients together in a bowl, starting with the juice of 1 lime, adding more if needed, to taste and adding enough water to get the consistency you like. Spoon the sauce over the tofu or use it as a dip if you prefer. Sprinkle with black sesame seeds if you like. Yummy warm or cold. Great for leftovers. Enjoy! This makes lots of sauce, so you may have extra to enjoy as you will. I served this yummy tofu on top of a bed of mixed salad greens and shredded carrots with an extra squeeze of lime and a few sprigs of mint, for a delicious healthy lunch. The tofu would also be great wrapped up in summer rolls with mint or basil, or stir into soba noodles topped with the tofu, shredded carrots, mint and chopped scallions for a more substantial meal or simply with a side of brown rice & steamed veggies with extra sauce drizzled over the top OR in my next post with cabbage slaw and ginger roasted sweet potatoes! Even though summer is becoming a distant memory I love making (and eating!) 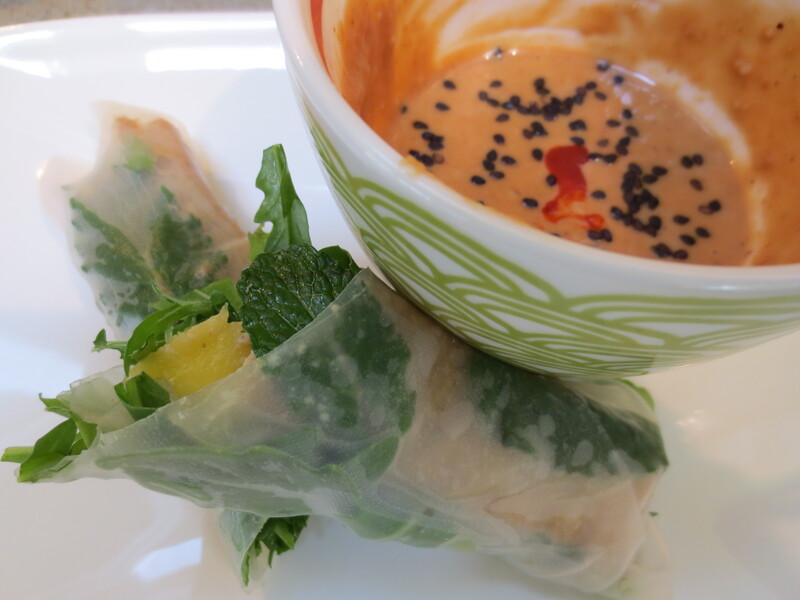 summer rolls any time of year and this is just another delicious variation. Really, you could fill them with just about any veggies and even your choice of proteins, so be creative and use what you like. This time around I couldn’t decide between using cabbage or arugula, so I just made a few with each and was quite happy with both tasty results. 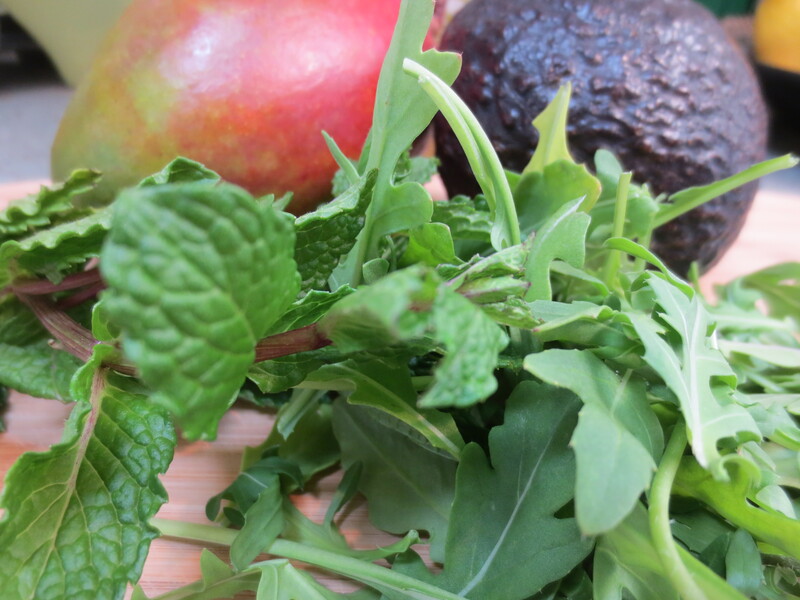 The cabbage adds a nice little crunch and arugula adds a little bit of a peppery bite. I love the way the cilantro adds another layer of flavor, but if it’s not to your liking you could happily sub in basil or mint with delicious results. The beets add a very subtle sweetness and a beautiful contrast of color. But again, if you’re not a fan of beets you could use carrot slices or mango as I do in this version. 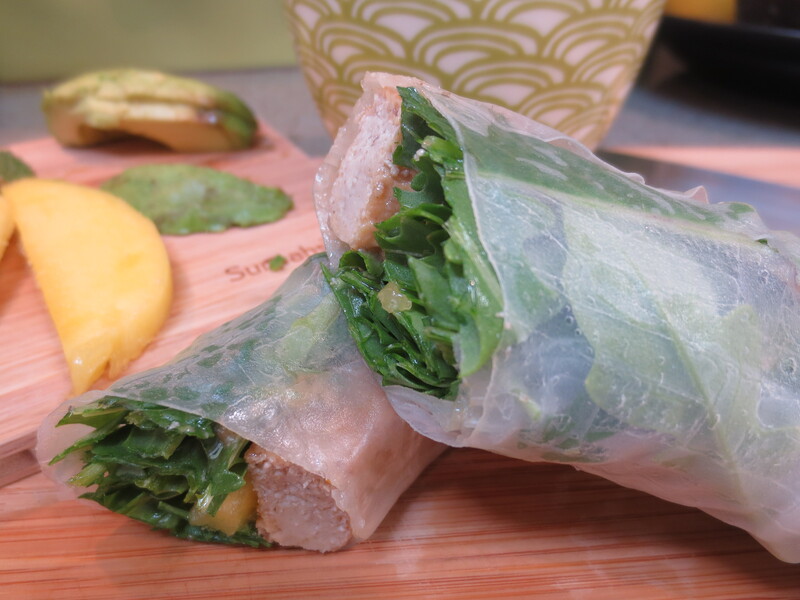 These summer rolls are so flavorful, light and fresh tasting, perfect for the warm days of Spring and Summer. They make a great appetizer or party hors d’oeuvres and are perfect as a light lunch or dinner served alongside a nice salad or Asian slaw. Starting with drained and pressed Tofu, slice the Tofu block into approximately 8 even slices and the then halve each slice lengthwise, leaving you with about 16 strips. Season lightly with salt. Meanwhile heat a large non stick pan and drizzle a bit of oil (I use olive, canola or coconut oil). Saute each piece of Tofu over a medium to high flame, adjusting temperature as needed, until golden brown on both sides. Beware of splatters when cooking. 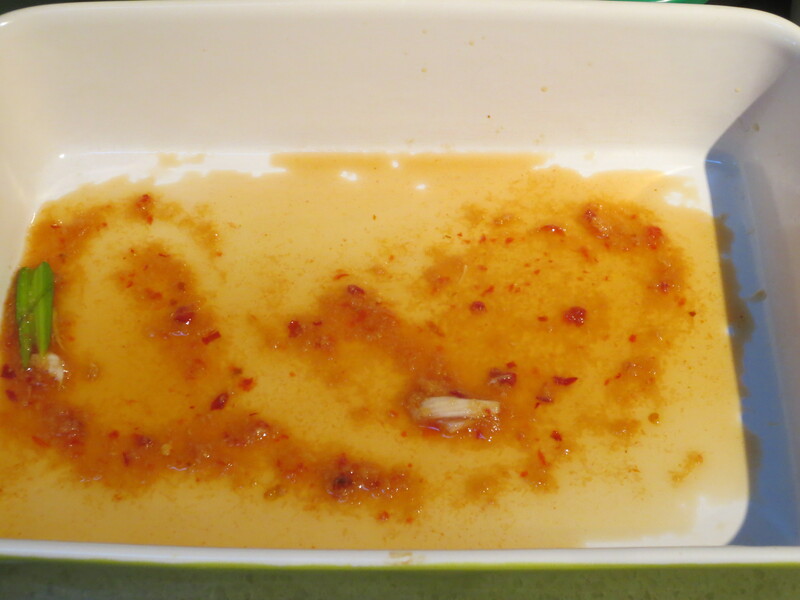 Whilst cooking the tofu, prepare the Miso Marinade. Add the cooked Tofu to the Marinade and refrigerate for at least 30 minutes to a few hours or even overnight. Refrigerating the cooked tofu allows the texture to firm up and also gives it time to absorb the flavors of the marinade. Fill a pie dish or other similarly sized bowl with warm water. 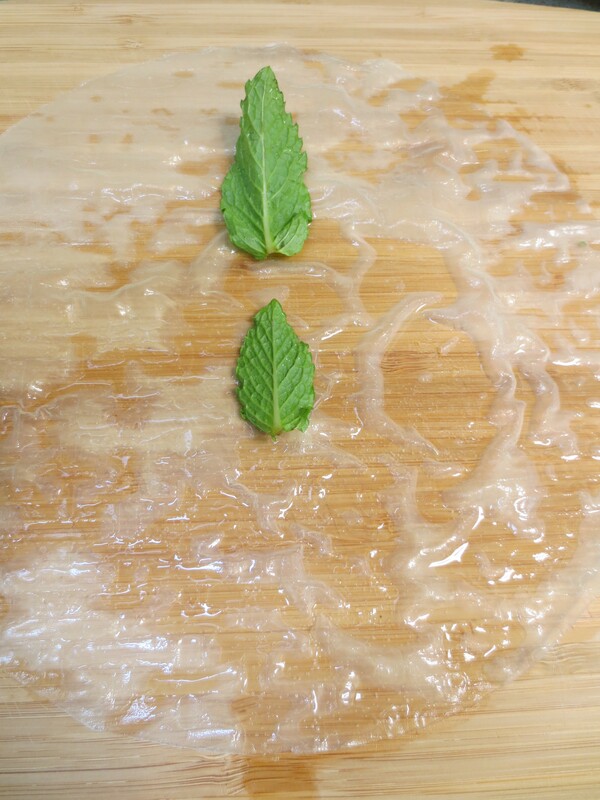 Working one at a time, soak 1 Rice Paper wrapper in the water until it softens. 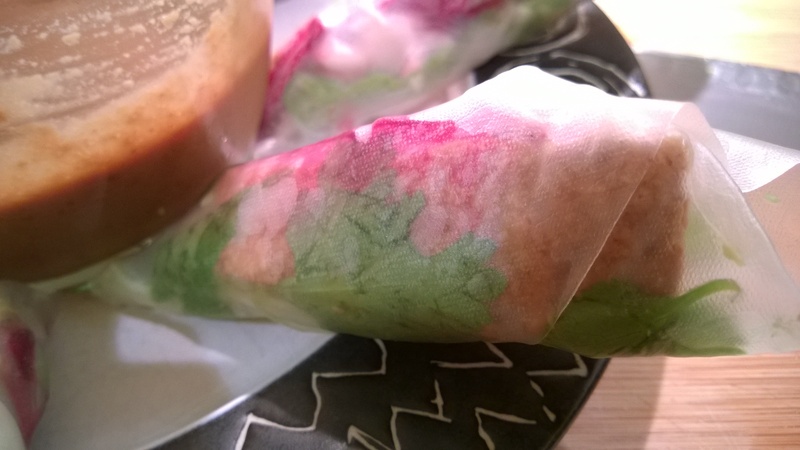 Beware, if you’ve never worked with rice paper wrappers before, they are delicate and prone to tearing, but don’t worry about small tears they should still wrap up fine. 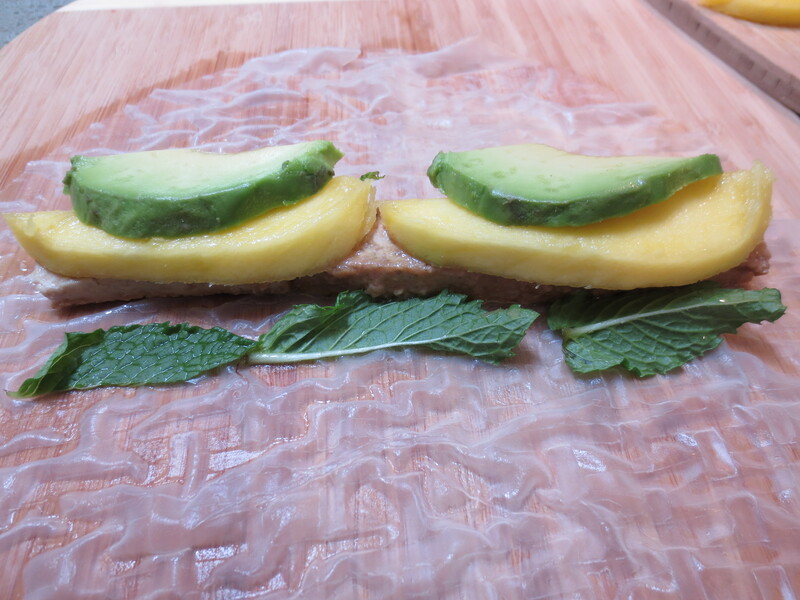 On a flat surface, like a cutting board lay out the softened Rice Paper (you can place a paper towel on top of your board if you like to help absorb a bit of extra moisture and prevent it from sticking to your board). 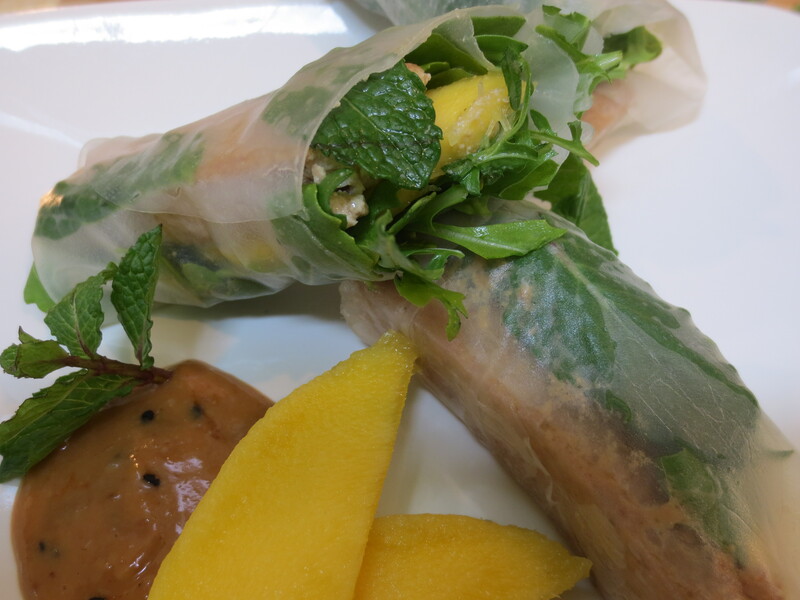 Begin to layer your filling – start with 2 -3 leaves of Mint placed vertically down the center of the rice paper. 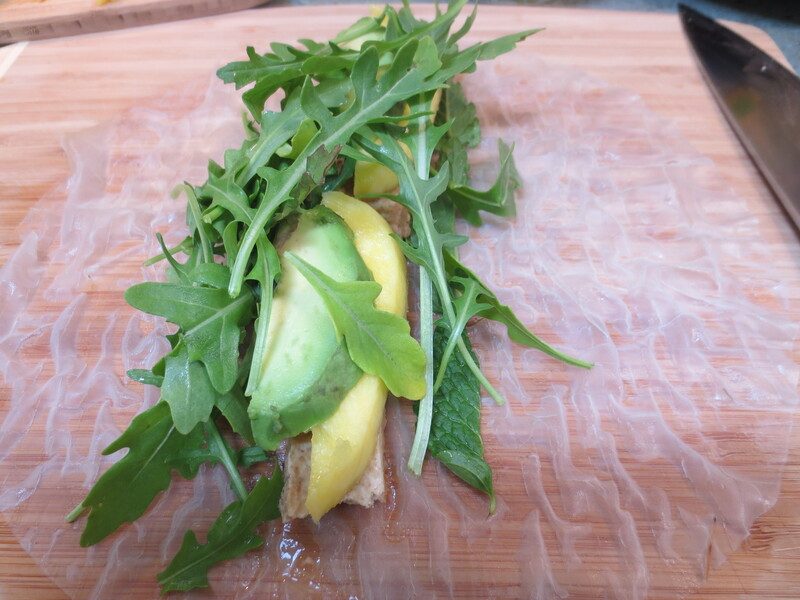 Next, line up 2 slices of tofu on top of the Mint, then 2 slices of Mango and 2 slices of Avocado, finishing with a small handful of Arugula and a little sprinkle of flaked Sea Salt. Now to wrap, if you’ve ever rolled up a burrito this is very much the same. 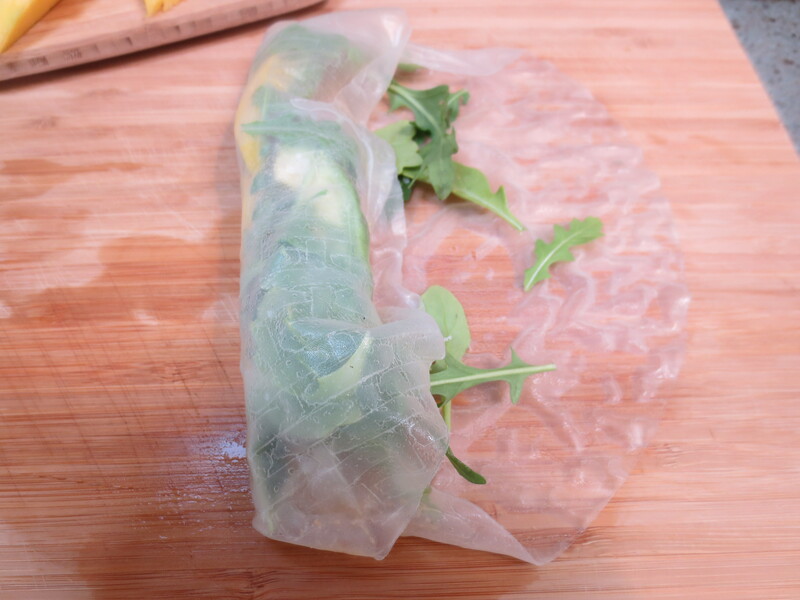 Start by folding up the ends over the filling, then , fold up one side over all the filling tucking it to make it tight, then roll the whole thing over the last end until it is completely wrapped, tucking as you go to make a nice tight roll. Using a sharp knife cut the roll in half (I like an angled cut). Now repeat. Place the completed rolls on a platter until done and then serve with either the leftover marinade or the miso cashew dipping sauce. Enjoy! Recipe Notes: These rolls take a little pre planning as you need to first cook and marinate the tofu before moving on to make the rolls, if you want to save time, you can use already baked and marinated pre-packaged tofu. Prepare Tofu: Remove from package and drain out liquid. Place in a rimmed plate or pie dish (to catch any liquid that releases) wrapped in a few paper towels and top with a heavy object (book, cast iron skillet, etc). Allow to press and drain out excess liquid for about 20 minutes. Note: do not skip this process, it will affect the texture of your finished dish and the tofu will not fully absorb the marinade. Meanwhile, Prepare the Marinade: Combine remaining ingredients, up to the Canola Oil/Cooking Spray in a small bowl or directly in whatever container you will marinate the Tofu in. After 20 minutes or so, unwrap the Tofu and slice each block into about 8 equal pieces (my last slice almost always ends up a bit slimmer). Leave the Tofu in slabs OR if you prefer, cut each slab in half lengthwise into “fingers”. 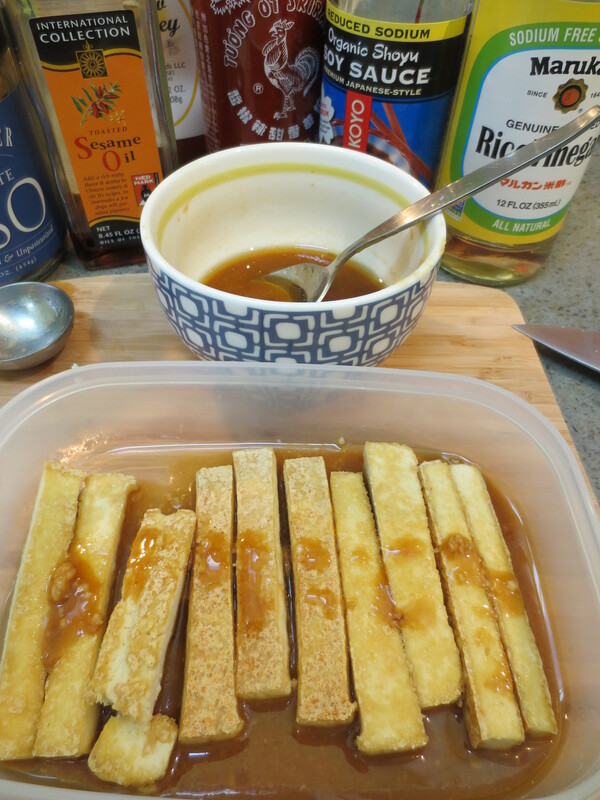 In a small casserole dish or lidded container, pour a little bit of the marinade on the bottom of the dish and then layer the sliced Tofu, pouring a bit more marinade between layers and top with all remaining marinade. Add the sliced scallions. Slosh around a bit so all the Tofu is covered in the marinade. Cover the dish and refrigerate. 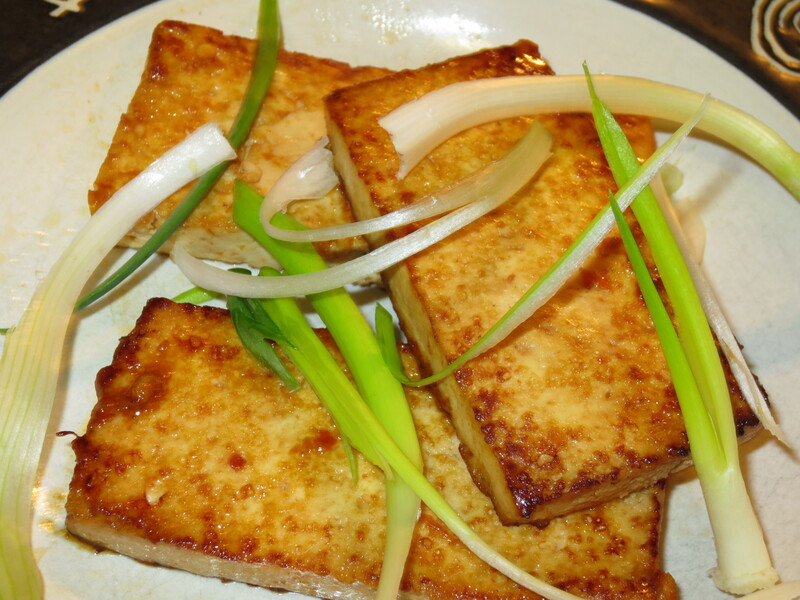 Allow the Tofu to marinate in the refrigerator for at least 30 minutes, all day, over night or up to 2 days. You can prepare it in the morning and it’s ready to go when you get home from work. To cook: If pan searing, heat a non stick 12 inch skillet over medium heat coated with a bit of Canola (or other light) Oil. If baking, pre-heat oven to 375 and spray a rimmed sheet pan with Cooking Spray. Remove Tofu from refrigerator, leaving the marinade behind, place pieces in your prepared pans. A 12 inch skillet can hold about 8 slabs or 12-16 fingers of Tofu at a time. Cook in batches, removing finished Tofu to a serving platter. Save the marinade. 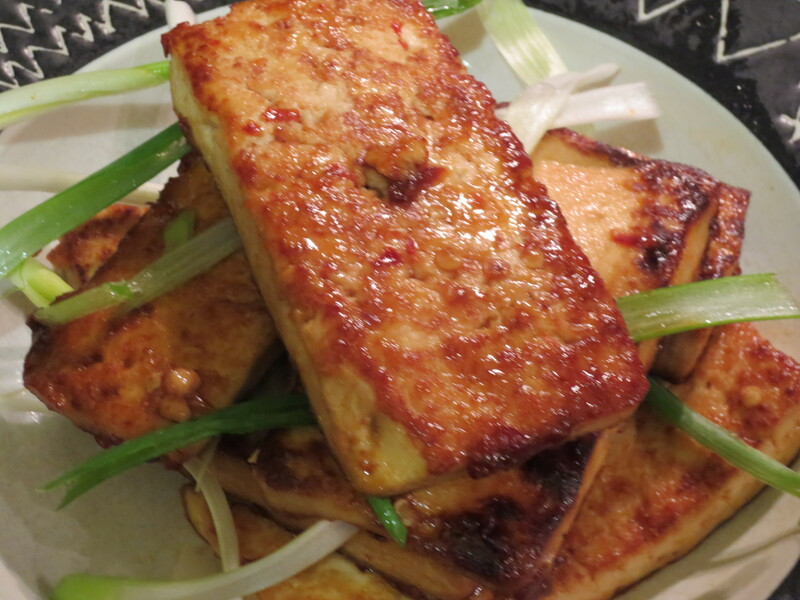 Pan Searing: Over medium-high heat, cook the Tofu about 7-8 minutes on the first side, then carefully flip and cook another 3 ½ – 4 minutes until both sides are golden. If necessary, add a little more oil to the pan. When all the Tofu has been pan seared and placed on a serving platter, pour the saved marinade into the hot skillet, lowering the heat to avoid splattering. If you wish, add a little more orange juice into the pan to help deglaze and make it a little more saucy (note there will not be a lot of sauce). Cook for a few minutes, allowing the marinade to reduce and slightly carmelize. You can then add some of the Tofu back to the pan and flip around the sauce or simply pour the sauce over the finished Tofu. 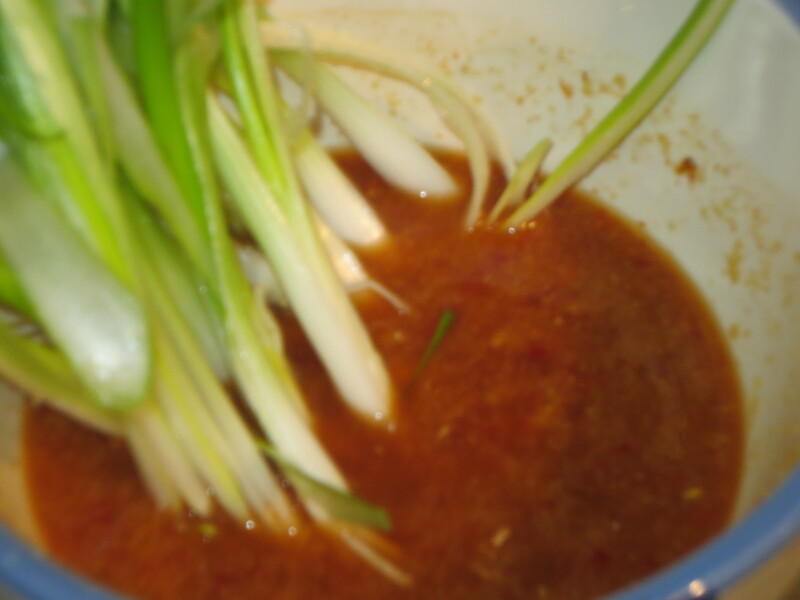 The scallions can be cooked slightly with the marinade or left raw. Oven Baking: Place all the Tofu in a single layer with a little space between each piece on the baking pan. Cook Tofu at 375 F for about 20 minutes, then flip and cook an additional 10-15 minutes, until both sides are lightly browned.